Last year I watched the complete run of the Bravo network's art based reality show Work of Art, and blogged about each episode. Like a lot of artists, I had a love/hate relationship with the show. I loved that there was a show on tv that showed some of what goes on in the creation of visual art, but I hated what the game show structure forces on the creative process. Plus the show shares the problem of all reality contest shows (even those on PBS! ), that contestants seem to be chosen who specifically lack the skills or mindset to meet the challenges, and possess enough personality disorders to guarantee that there will be group conflicts. Although the network gave it very little promotion and only one primetime airing per week, enough people watched it that they renewed it for a second season, which premiered a few days ago. I don't know if I will be blogging each episode again, and it probably won't happen on the same day that the episode airs, like this post. Anyway, here goes. The season premier includes 14 contestants, all but a few from New York City. Unlike the first season, even the oldest contestant is younger than me. And I'm pretty sure that I have no connection to any of them. The producers stocked the cast with some typical art world characters, including one who goes by the name, "The Sucklord." The episode was titled "Kitsch Me If You Can", and the challenge was to choose a piece from a room full of bad art- the kind of stuff that you might find at a garage sale or flea market and isn't good enough to sell even at those prices- and transform it into something good. Some of the contestants went along with the instructions to make use of the original piece in the final version more than others. It appeared that most of them just did the same thing they always did with previous art. Eight were sent to safety, and the others kept for the winners and losers crits. First night winner Michelle's piece may have been the best, but it was hard to tell because all the producers gave us was about 3 seconds of the camera panning over it. I would have preferred a much longer view, but that would have taken away from all the time showing young attractive Lola moping around with no clue as to what to do for the assignment. (somehow the thing she threw together at the last minute got her into the top 3) The Sucklord ended up in the bottom three, along with two other men. I would agree that Bayete's piece about racism was unfocused and he should have been able to explain better what he wanted from the work, but it seemed that the judges' critique was a bit harsh. (some of that may be the editing- judge Jerry Saltz said in his blog that these sessions can go on for up to 45 minutes per artist) In the end, Ugo, the tall handsome Frenchman with an accent, was sent home, with him still not understanding why so many people thought his Keith Haring derivative art lacked originality. I get the impression that Ugo's career may owe a bit to gallery people just like having him around to look at. Last year I generally had a relatable story to the theme of the week, and that continues for this episode. Several years ago I was invited by Cassandra Simon to be part of a group folio called "Blatantly Kitsch". I met Cassandra at the SGC conference at Rutgers, where she was part of a pack of Wash U. print kids out there with Tom Huck and other St Louis printmakers. Some of those students had memories of my earlier visit to St Louis, and bringing them some St Joseph's pastries on March 19th cemented my reputation with them. The idea behind the portfolio was to create art that made use of materials more associated with crafts than fine art. 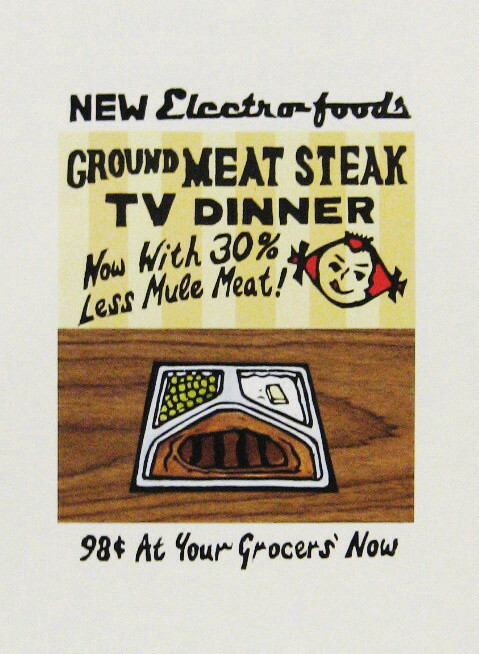 There can be a lot of kitsch value in older objects, and so I looked to the past to come up with my concept, a fake vintage ad for TV dinners, which themselves have a kitsch quality. 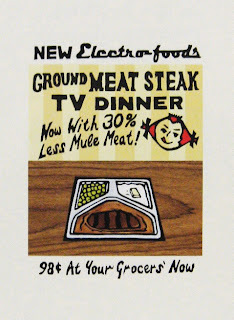 The mule meat reference came from a dog food label of that era, found in the basement. I had to rely on memories of the classic aluminum foil compartment tray that was still common in my youth, since Swanson and the others switched to microwavable plastic years earlier. The little girl logo borrows from some 50 year old advertising graphics without directly copying anything. The pattern of stripes in upper half is a piece of scrapbook paper overprinted with the block, and the wood grain table is actually some contact paper. (Martha Stewart brand) The stated price was the cost of the original TV dinners (invented to use up some surplus turkey that the company didn't want to pay to freeze anymore), remarkably a price I also found on sale priced frozen dinners five decades later. Getting everything to line up took a little planning, but I think it was worth it.